Vibrant colors in fluid glistening vessels and free form sculptural shapes greet visitors to the Baker Arts Center’s current exhibit of Blown Glass by John McDonald. This unique display opens with a reception on Saturday, November 22 from 5:00 to 7:00 pm at 624 N. Pershing in Liberal. The exhibit runs through January 10, 2015 and is sponsored in part by a grant from the Art Alliance for Contemporary Glass. Johnny’s glass art is inspired by seeing what he imagines in his mind come to life at the end of a pipe. 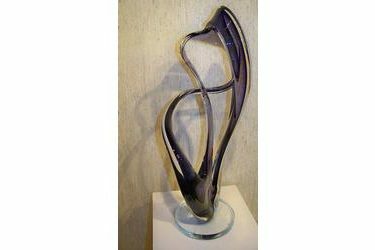 Each creation is formed by blending, mixing, or layering colored glass to create unique art pieces which are merged using the age old process of glassblowing. The individual forms are molded into shapes by spinning, twisting, cutting and pulling the molten glass using hand tools and gravitational force. With almost 30 yrs. of experience, John’s glass art can be found in galleries worldwide. His interest and talent in the art of glassblowing developed during his high school years in Liberal, KS. He continued his education in the medium for two years in community college and seven years as a glass blower in a Wichita, KS studio. He established Meridian Street Art Glass in 1999.